It’s not very often that I post failures. I’d like to think that I have an idea what will work and what won’t work. I subscribe to Sew Today and eagerly await the new season’s patterns every month or so. Sometimes patterns leap off the page demanding to be made. Others, I ponder for a while and then decide one way or the other. This one was a ponderer. I particularly liked View C. So eventually I ordered the pattern, but I still wasn’t sure. A comparison with my go-to wide legged trouser pattern caused me concern. The black and white ones are ‘big enough’. The maroon ones, McCalls 7576, are huge. Here’s a set of comparative picture in my friend’s garden. I had commented that I wasn’t sure about the maroon ones, as I thought that they were huge. Otherwise described by McCalls as ‘very loose fitting’. I mean, they are almost dangerous, in terms of large amounts of excess fabric that represent a trip risk! Its hard to know when to wear them, as there is so much fabric that they are quite warm; but you would wear them on a nice (dry) summer’s day. They’d be awful if they were wet! The fabric cost me £2 per metre on the market, and was deliberately ‘cheap’. The black and white trousers are New Look 6271, which I have made before here. I’ve worn them a lot this summer. I made a matching infinity scarf, and have worn that with the trousers on a surprisingly large number of occasions. In fact, the other day, someone who didn’t know I sewed, worked out that I did, because I was sporting matching trousers and scarf! So then I decide to try to cut a pair of New Look 6271 out of the McCalls wide legged fabric! It almost worked. I got new front sections out of the front, but the back didn’t work, as the crotch on the McCalls pair is cut significantly differently to the New Look pair. Its much lower. I think that a lot of the excess fabric is on the inside leg. Its close, but in my opinion, not close enough, however much I pulled and tugged at the fabric, the straight grain of which is, by now, lost forever! The original trouser length did not permit me to pull the pattern down a few centimetres. 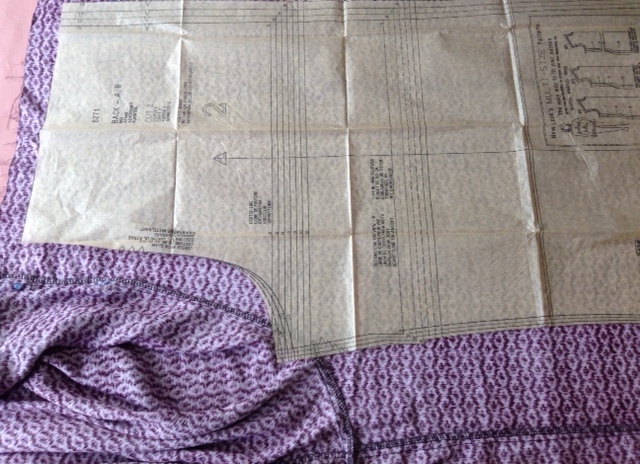 So then I looked a cutting a skirt from the fabric…. You know how it is; don’t waste anything, even if the fabric was deliberately ‘cheap’. But I have summer skirts that I have cut from left-over fabric, and don’t wear much. So stop it Ann! Go and write up a blog post instead! I’m still not sure what to do with the fabric. I hate to throw it away. Oh no. I hate it when something doesn’t work out like this. You’re completely right, they are biiig trousers, and I think you’ve made the right choice. Hopefully some inspiration will come on what to do with the fabric! 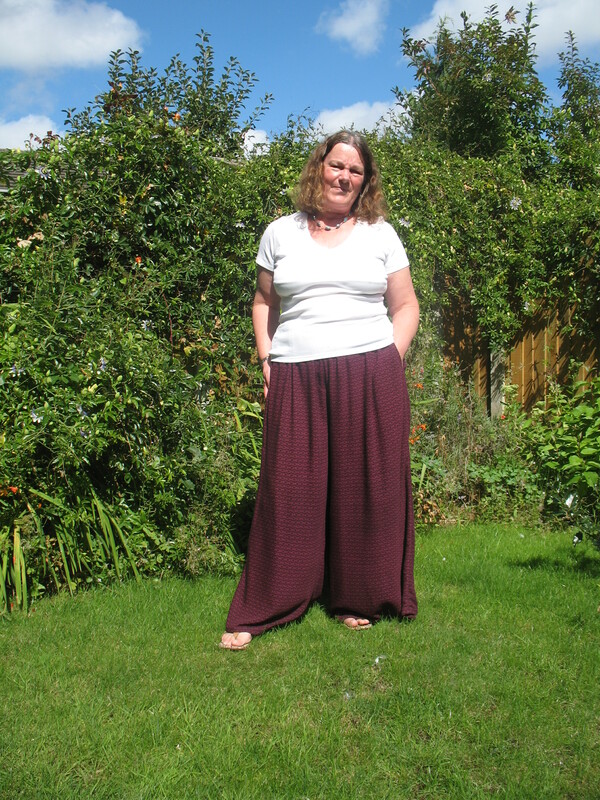 This entry was posted on September 5, 2017 by ann hebden in Fashion, Handmade, McCalls, New Look, Sewing, Trousers and tagged Fashion, Handmade, McCalls, New Look, Sewing, Trousers.